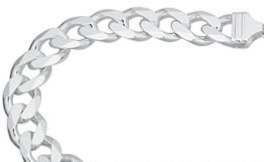 Sterling Silver solid Curb Bracelet 7mm gauge. Popular style curb bracelet , approx dimensions 7mm wide 210mm length. Curb style links and lobster clasp. High polish finish. Heavy solid diamond cut Curb Bracelet solid classic Curb links.